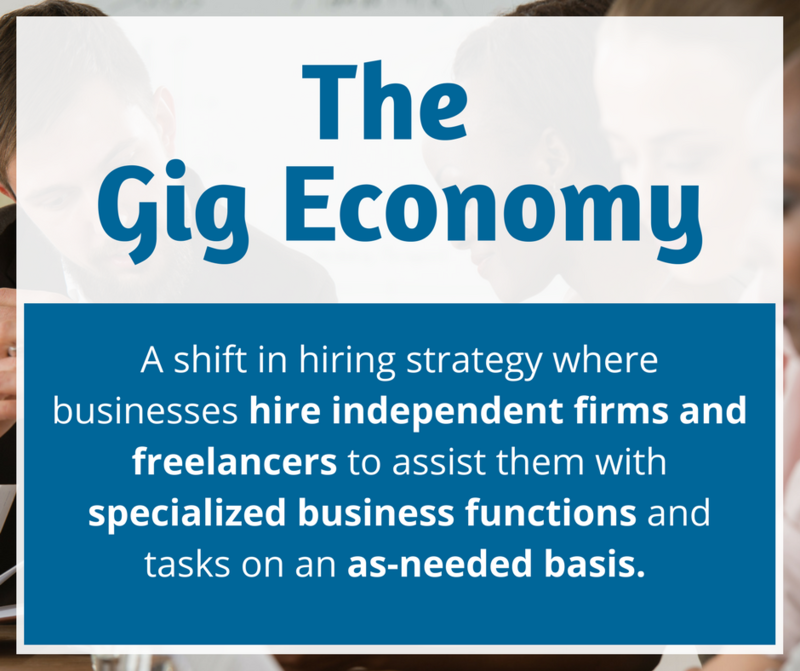 The “Gig Economy”: What Is It & How Can It Benefit Your Business? Every summer, kids knock on my door to ask me if I want them to mow my lawn. These kids get it. They can see my lawn needs to be mowed, and here they are, with tools and experience, ready to get a job done that I obviously don’t want to do myself. Without even realizing it, they are early entrepreneurs taking advantage of a worldwide shift towards a “Gig Economy”- where a project or task is outsourced to a qualified freelancer or specialized firm on an as-needed basis. We have seen a growing trend in the way businesses are approaching their workforce. Rather than employing a large, in-house staff, they are becoming more focused on hiring only a small group of core leaders who manage remote or on-demand labor forces. Essentially, the “Gig Economy” is a new way of looking at an old solution to business growth- outsourcing. There are many jobs that have been “outsourced” for a long time, either to talented individuals or to specialized companies. We no longer have personal courier services on staff- we outsource to someone else, such as FedEx, USPS, or UPS to handle that for us. Why? Because we know that they are experienced, focused, and dedicated to doing that one thing REALLY well. They also make it easy and affordable for us to only get the services that we need, as we need them. This is essentially what the gig economy is all about. Manufacturing plants use temporary labor, agriculture jobs have long used migrant labor, and many organizations use independent organizations to provide all sorts of services such as cleaning, accounting, and tech support. Finding specialized, short-term labor is not a new solution, it has simply become much easier to find the right person or company to assist you than ever before. Employers now have access to complete job histories of experienced, on-demand labor right at their fingertips. Whether they are looking for an individual or a company to assist them, they need do nothing more than a quick internet search to find a multitude of qualified candidates ready to get to work. Not only has the internet increased your ability to find a qualified candidate quickly, it also allows you to more easily utilize a global network of talent. You are no longer limited to the skills, talent, and dedication of those who live in your immediate area. Sites like Upwork and Fiverr have been an absolute game-changer for specialists, allowing them to create a virtual resume, complete with reviews from past employers, satisfaction guaranteed payment systems, and the ability to take on work at their discretion. Google has also played a critical role in the way that specialized support organizations are found. Rather than hiring a single specialist to perform a task, companies have the ability to hire a specialized firm to handle an entire branch of their business operations, such as marketing, manufacturing, or customer support. Google provides all of the information you could ever need about a firm, allowing you to make an educated buying decision more quickly than ever before. Write down what your business does in 5 words or less. It may be “Family Law Firm” or “Commercial Sign Manufacturing” or “Business Lead Generation”. This is your core business function, and all of your in-house hires should be focused on forwarding that singular goal. If it doesn’t fit, get someone else to do it. Individuals or firms can offer specialized labor or perform specific tasks for your business, and many organizations already use support firms in some form or fashion. Think about your entire customer journey, from acquisition to retention, as well as the supporting functions required to stay in business. Which of these functions is your current team doing well, and where do you need the most support? Where are the stumbling blocks that are keeping you from success? If you can identify where you need help, then there is an experienced individual or company out there ready to assist you! Specialized firms can handle business functions that require specific skills, knowledge, or tools to complete effectively and efficiently. While most jobs or tasks could be done in-house, most companies are recognizing that this isn’t the ideal scenario, and are moving to make strategic partnerships with firms that can support their business goals while saving time and money. At Mark My Words Media, we are a specialized firm providing online lead generation services to our clients. The internet is readily available for anyone to use, and any company can choose to do online marketing for themselves. However, as a specialized agency in business for over 20 years, we know that there are many reasons why working with us as support firm is far superior to hiring your own team. Cost-Efficient: We can provide an experienced team of marketing professionals at less than the cost of one in-house marketing employee at a moderate skill level. Plus, there are no training costs, expenses related to the interview process, matching taxes, providing benefits, or scrambling to find replacements when your employee leaves you high and dry. Results Focused: The reputation of our company and future of our business depends on doing a great job for you, making us extremely driven to deliver results. We have a lot more on the line than a typical employee. If we do a poor job for you, you are going to tell people and it will impact our ability to gain future business. Any employee, on the other hand, will just go get another job. Continued Education: An employee’s education ends when you hire them. They are then task-focused, only seeking education when absolutely necessary. We are driven to outperform our competitors to win the trust of clients every single day, meaning that we need to be learning and updating our skill set constantly to maintain a competitive advantage. Synergy: When someone works only for you, they are only able to see your results. When you work with a specialized organization who services many clients, you are able to get the benefit of a broader set of information. This allows us to identify patterns, make adjustments, and optimize your campaign much faster than an individual utilizing a single set of data. When you are sick, you go to the doctor, you don’t hire a doctor, right? If you aren’t a marketing firm, it doesn’t make sense for you to hire employees to be focused on marketing or lead generation. The same can be said for many other business functions and tasks, such as customer service, accounting, tech support, landscaping, facility maintenance, interior design, and many more. Hire specialized firms with the resources and experience to make the right decisions for you, and utilize your funds to hire employees who can support your main business functions. When determining if a task or function is best outsourced, there are some parameters that can help you make the right decision. Is someone on my current team skilled at this task? Is this something they enjoy doing? Is it important enough for them to take time away from their other tasks? Does this fall within their job description? Does this support your career path for that employee? If you answered “No” to any of these questions, then that task is not right for you to perform in-house with your current staff. Depending on the importance of the task to your business operations, then you may need to find a freelancer, multiple freelancers, a specialized firm, or potentially begin your hunt for a long-term, on-site employee. While some business owners are concerned that an outsourced employee won’t have the same dedication as an on-staff employee, labor statistics simply don’t agree. Gallup reports that, at any given time, 51% of the workforce is looking for a new job. This means that your employees may not be as dedicated as you think. When you use an outside firm or individual, they have their entire career on the line making them much more dedicated and driven to do a good job, as every task they perform is vitally important to their long-term earning potential. Just because you are using a freelancer for a one-time job doesn’t mean that you can’t build a long-term relationship with them. Many companies find that they regularly utilize the same freelancers for common projects and tasks. The flexibility of a freelancer means that they aren’t counting on you for a full paycheck every week, but are typically excited to take on work from you on an as-needed basis, as long as you maintain a positive working relationship with them. If you have paid appropriate fees on-time, provided reasonable timeframes for work completion, and left good feedback for past work, most freelancers appreciate repeat customers and clients. This gives you the flexibility to get tasks completed quickly and professionally, by individuals who have proven themselves to be an asset to your team in the past. Working with a freelancer requires a much lower initial investment as well, so if they don’t meet your needs, you have much greater flexibility to find someone who does than with a traditional in-house employee. 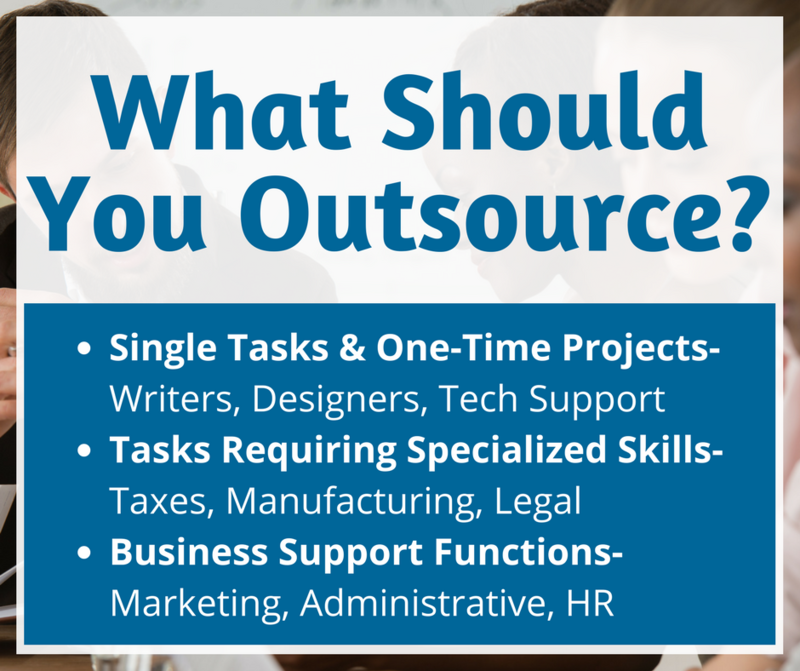 Outsourcing non-vital job functions can also be a great relief for your employees. As an employee of a business, it is not uncommon for you to be expected to perform a multitude of functions, many of them outside of your core competencies. While these challenges may result in a more well-rounded employee, they may also result in poor quality of work and reduced job satisfaction, especially when this type of assignment is given out of necessity rather than as part of the employee’s career path. When you outsource tasks and processes that fall outside of your core job functions, then you are freeing up the time of both you and your employees to focus on developing the business specific skills you need to achieve personal and business growth. This is when you start to see your business shift from surviving to thriving. The Gig Economy benefits service providers in more ways than simply allowing them to outsource distracting job functions. It also allows them to become a specialist for other businesses. Service businesses and B2B companies don’t have to worry about “doing it all” anymore. Companies are looking for specialized firms and strategic partnerships to help them get ahead, and you can be there to fill the gaps for them. All you have to do is the one thing that you do really well, and build an online reputation that reflects your ability to deliver through positive review generation and a focused online marketing campaign (which we can handle for you!). Is Your Business Gig Ready? While the advent of a gig economy seems like a win-win for both employers and workers, there are always negative impacts to any sort of change. The potential negative impacts of utilizing on-demand labor or specialized support firms can be mitigated with proper planning. So how can you best prepare your business to move into an on-demand labor system? Create an Outsourcing Plan: It all starts with a plan. Critically evaluate the tasks required for you to deliver your products/services to your clients and all the various support functions and tasks, then categorize those tasks into segments such as Completed In-House, Managed In-House, or Completely Outsourced. Once you know what functions you want to perform, manage, and outsource, you can effectively build an on-site team that meets your needs, and develop a plan for getting everything else completed consistently or as-needed. The Project Brief is Everything: Before you can hire someone to do a job for you, you need to specifically define that job, your requirements, budget, and any important information or specific processes you need your freelancer to adhere to. Not only does this let them know what exactly you expect of them, it allows you to ensure this specific task is done properly each time, regardless of who completes it, and can save you a lot of time down the road. The Bulk Approach: Just as with any type of hiring, be prepared to look at a lot of profiles and to make a lot of connections that don’t work out. The benefit is that you have a lot less invested in each candidate than you do in a new hire and more information to base your decision on. Just as not every employee works out, not every freelancer is right for every project or company. Whatever label you put on it, from freelancing to contracted work, the Gig Economy is really nothing more than finding skilled outside labor that is ready to assist you. Whether you need a focused agency to assist you long-term with a specific component of your business, or simply need to temporarily increase your labor force for a heavy season, there is no question that contract labor or outsourcing is a great solution for many different businesses and niches. Ready to outsource your marketing and start getting high-quality local leads? We are excited to become your Online Lead Generation Partner! Reach out to Mark My Words Media at (877) 721-8491 for a Free Consultation.